Good Monday morning, beautiful readers! I know all my posts lately have been about beauty products but I promise this isn't turning into a beauty blog. It's just that I've been mostly at home being a mom (for those adventures, you can check Topaz Mommy!) 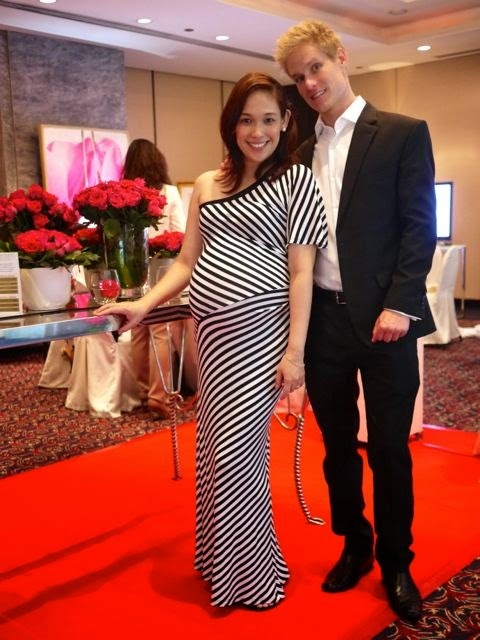 so I just write about the stuff that's making this pregnancy a beautiful one: beauty products! 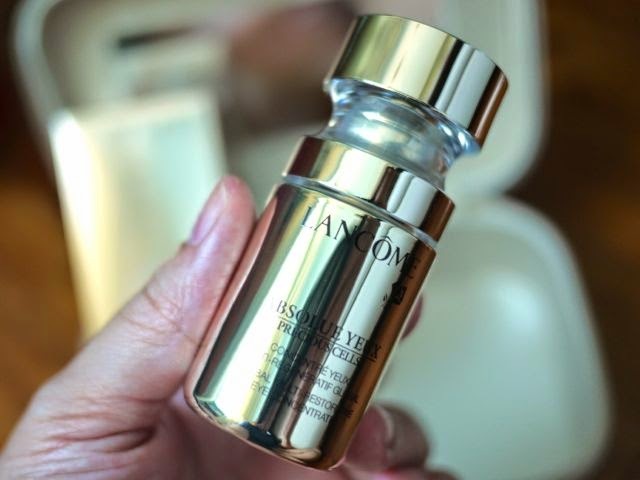 Anyway, I did venture out of the house last week because Lancôme, one of my favorite brands in the world, invited me to an intimate brunch at Manila Peninsula to launch the new Lancôme Absolue Golden Glow, its latest luxurious skincare line created after 20 years of research into skin stem cells. Skin will look younger with a distinct golden glow. I'm super excited to try this line! Here I am with Sasu Hurme, Lancôme's product manager. He was amazed that this was my third pregnancy, and said very kindly, "Your husband must be so very happy." He is, he is, Sasu! That's why I need to make myself beautiful for him because he makes me happy, too! 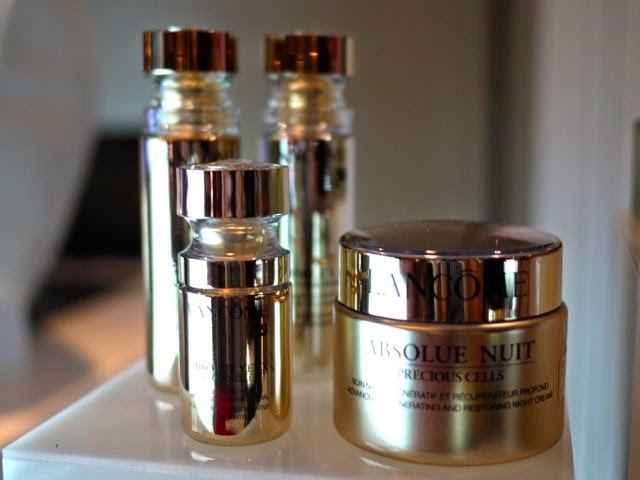 Here are a few products from the new Absolue Golden Glow collection. 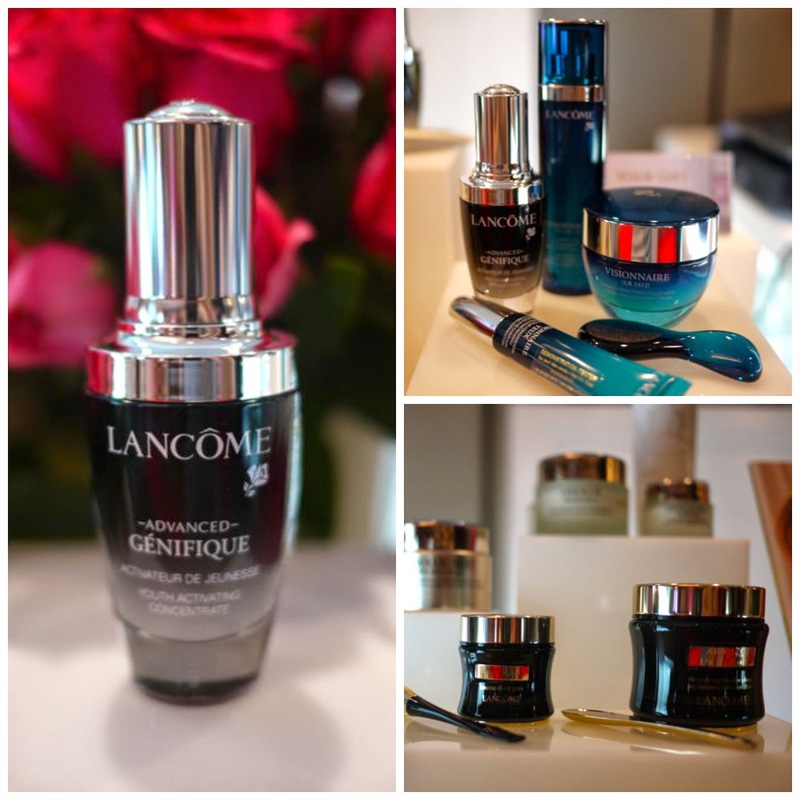 Inspired by nature's endless regeneration abilities, this skincare line uses precious oils from flowers, extraxts from linseed and chlorella, and Pro-Xylane technology which produced Lancôme's most effective anti-aging molecule. Oh yes, there's makeup, too! This is the foundation but it's really a skincare product because it contains the same ingredients as the Regenerating Oleo-Serum so with each use, your skin becomes more radiant, wrinkles and fine lines fade, skin is infused with a healthy glow. (black bottle) There's Génifique Youth Activating Concentrate, to use after toner and before serum. This is what Catherine, Duchess of Cambridge, uses! (blue products) The Visionnaire line boasts that women who use it stopped or delayed cosmetic clinical procedures! This refines skin—pores and fine lines seem to disappear, texture improves and smoothens. (black jars) Absolue L'Extrait. These are skin elixirs for erasing lines. A clinical study showed that with just 11 weeks' use, there was remarkable improvement in forehead wrinkles, frown lines, crow's feet, undereye wrinkles, nasolabial fold, and lines around the mouth. 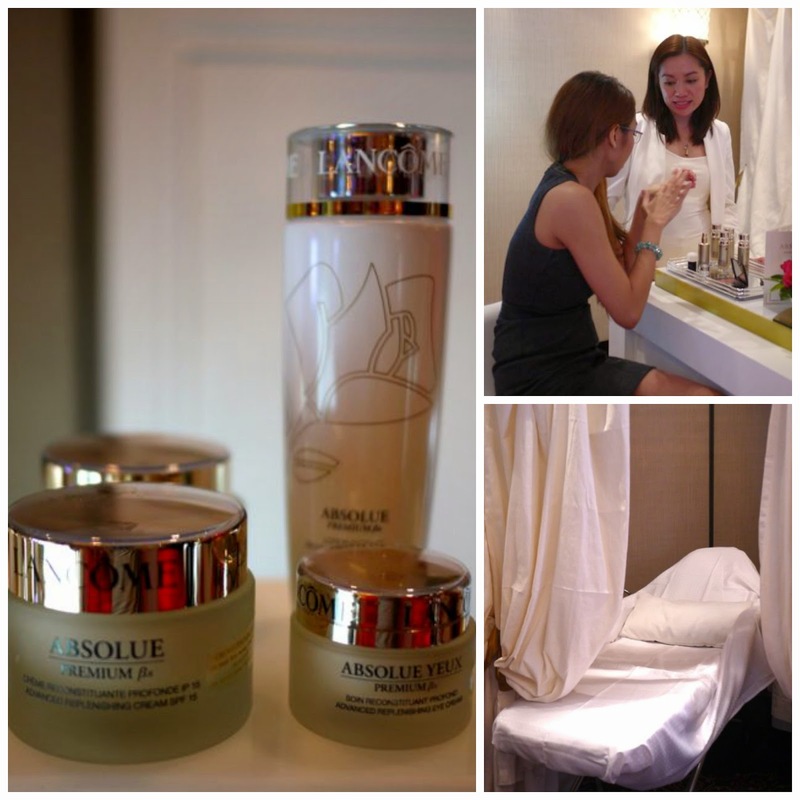 (white and gold products) Absolue Premium promises extreme moisture to plump up skin. At the event, we also got skin consultations and luxe facials. I didn't avail of the facial since I've already bought facial treatments at Lancôme Shangri-la Plaza. 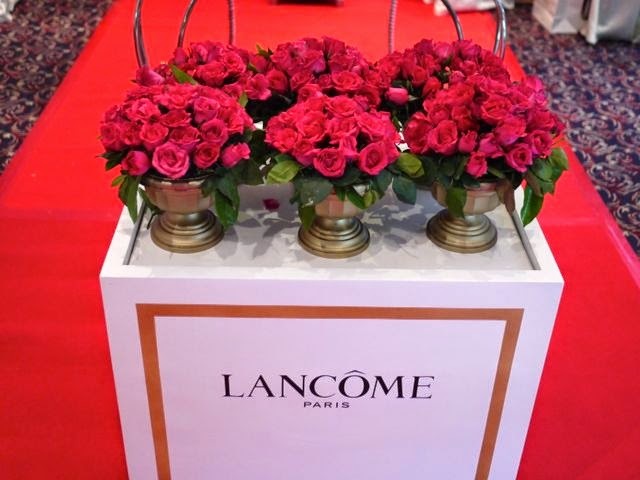 Drop by the Lancôme counters/shops and ask about their facials. They are so relaxing and makes me gorgeous! 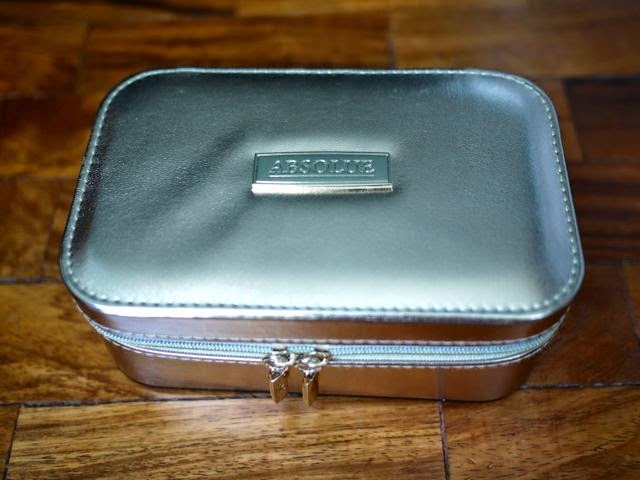 A small vanity kit in gold leatherette. Oh my! I die! I die! 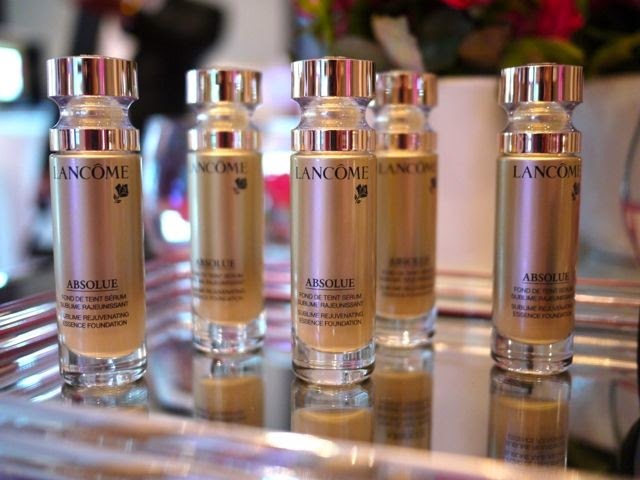 The Absolue Sublime Rejuvenating Essence Foundation. A full size tube costs Php 3995. 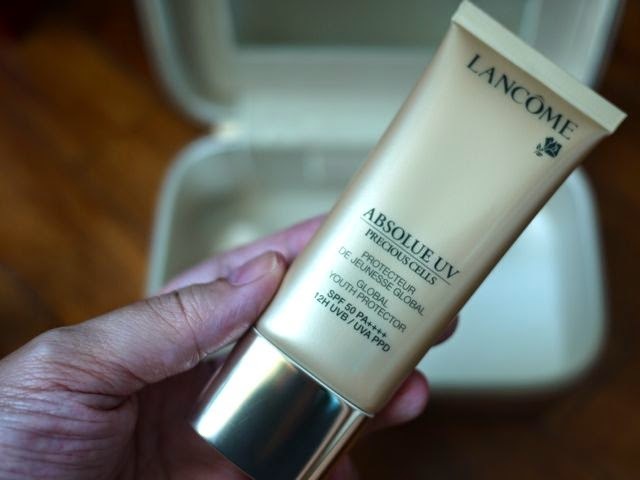 The Absolue UV Global Youth Protector SPF 50, Php 3595. 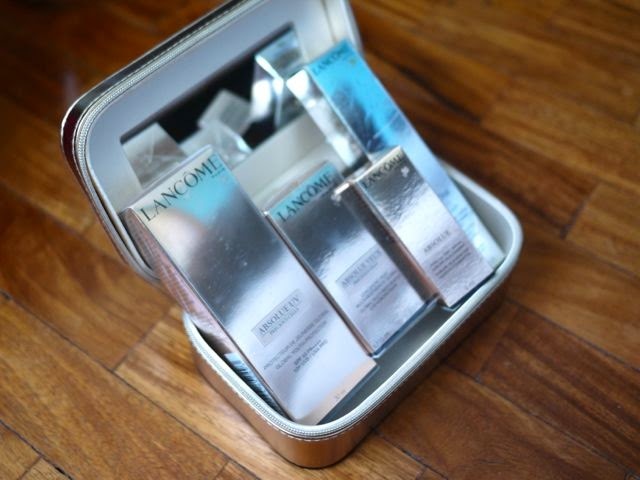 I love Lancôme's sunscreens! They're some of the best! 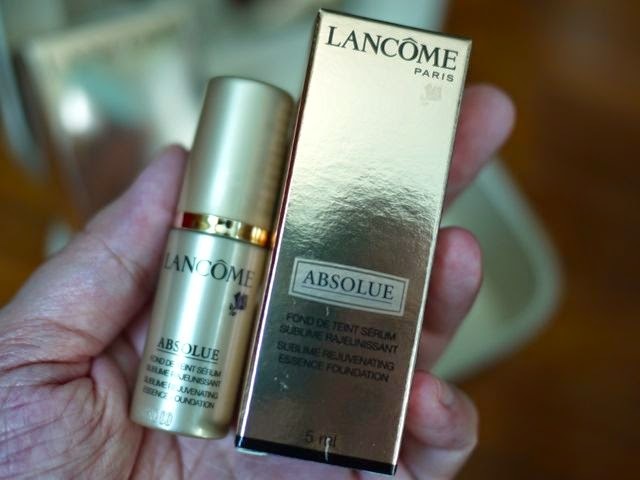 The Absolue Yeux Global Multi-Restorative Eye Concentrate, Php 6995. Can't wait to try this!!! 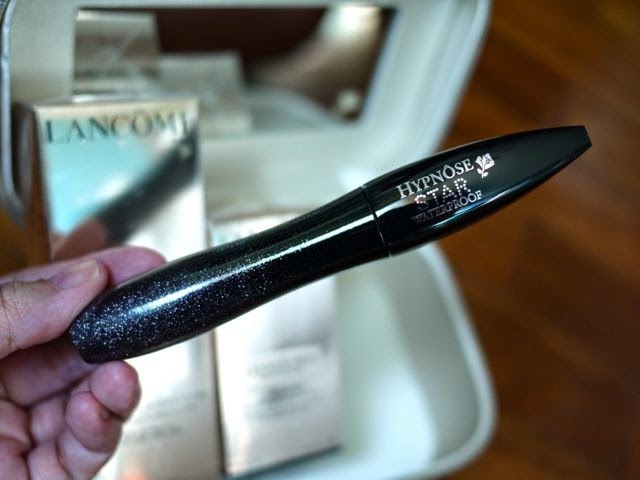 The Hypnôse Star mascara. 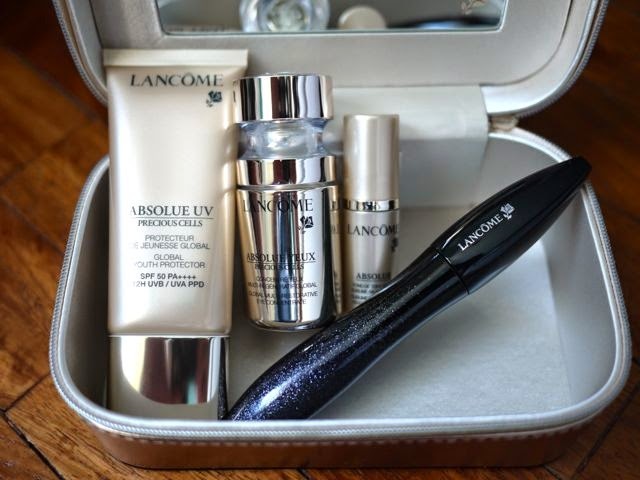 Lancôme's mascaras always make it on the favorites of beauty editors and makeup artists! 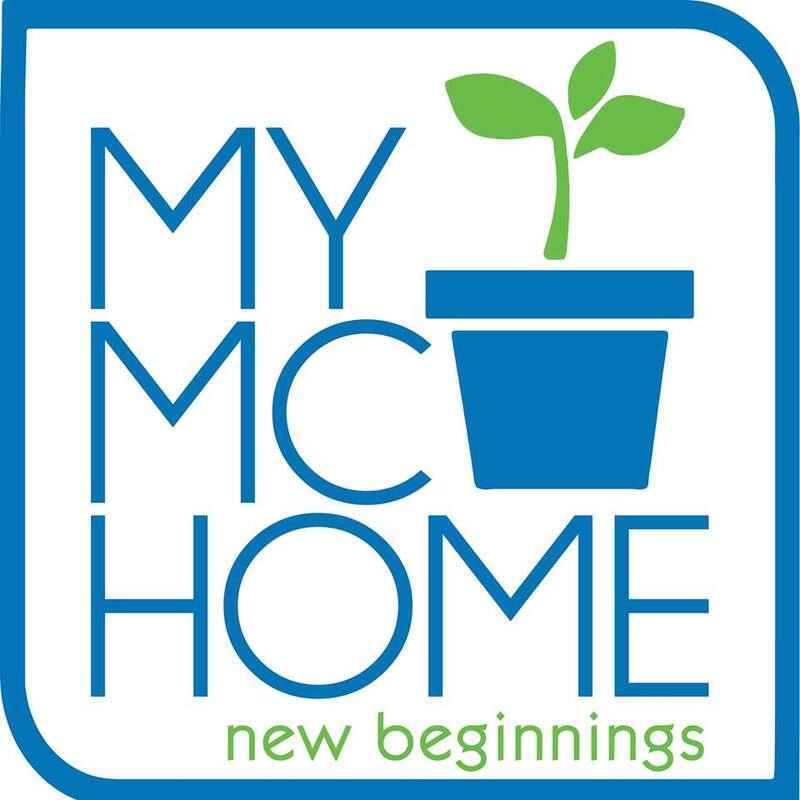 I'll use these products after I give birth and I'll give a proper review. 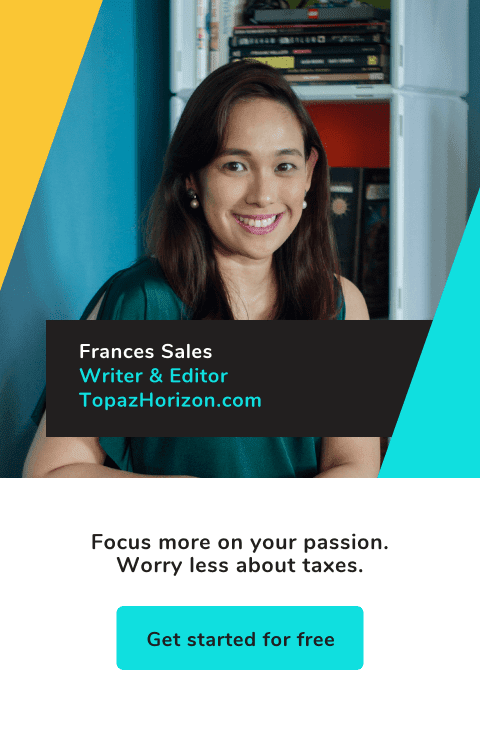 For more information, visit the Lancôme website, or their shops and boutiques at Greenbelt 5, Rustan's Shangri-la Plaza, Rustan's Makati and Rustan's Alabang. Like the Lancôme Philippines Facebook page. Follow them on Twitter and Instagram (both @LancomePH).